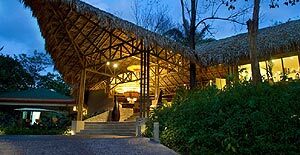 (Manuel Antonio, Costa Rica) – One Costa Rican resort recently won some awards for its sustainable tourism approach, while a new eco-tour in the Limon province involves a forest tram and chocolate. Rain Forest Aerial Trams in Costa Rica, with Atlantic and Pacific locations, is launching its Caribbean Cacao Experience, for cruise ship passengers traveling with Carnival Cruises. Immersing guests into authentic Costa Rican culture, and history, the program traverses the Limon province. All this is sweetened by a lesson in traditional chocolate making. The Caribbean Cacao Experience begins with a 40-minute air-conditioned motor coach ride to Hone Creek District, home to Cahuita National Park. Upon arrival to the Cacao Trail property, guests take a close encounter with nature in the orchids and bromeliads garden. Next, they can discover the Ú SULE - a classic “tee pee” of the Bribrí and Cabecar Indigenous. Once used by the “Chamans” (healers), it has also been home to social acts and ceremonies over thousands of years. Transport to the beginning of the century through Costa Rican art. Sculptures represent the life, style and history of original Afro Caribbean settlers. Visit the “burrocarril” station, an alternative transportation created by the Cahuitan community. The sweetest step of the Caribbean Cacao Experience is learning the history of the Cacao. Interact in the traditional methods of chocolate making. Finally, enjoy a presentation of an organic banana and sugar cane plantation. For information or reservations at Rain Forest Aerial Trams, call US/Canada toll-free 1-866-759-8726 or visit www.rainforestrams.com. Costa Rica’s Arenas Del Mar Beach and Nature Resort has reached its dream of achieving the highest rating for sustainable tourism within two years of operation, and was awarded five “leaves” this month by the Costa Rican Tourist Board ( ICT), the first resort to achieve this distinction so soon after opening. Created by the ICT, the Certification of Sustainable Tourism program (CST) was designed to differentiate tourism businesses based on a sustainable model of natural, cultural and social resource management. Participation in the program is entirely voluntary and is open to all hotels, inns, bed & breakfasts services, cabins, as well as tour operators and travel agencies in Costa Rica. In addition, Arenas Del Mar, which opened in 2008, was awarded three stars out of four, under the "Bandera Azul Ecológica" (Ecological Blue Flag) program. Implemented in 1996 and inspired by a similar program developed in Europe, Bandera Azul supports development while curbing the negative impacts of mass tourism. It encourages the local community to reduce pollution and protect the environment. The program evaluates the environmental quality of coastal areas, in terms of the quality of the beaches and sea water, access and quality of drinking water, water and waste management, security, and environmental education.